This was a fun climb on a Sunday during field camp. After doing Challenger Point the day before, I wanted to climb something in the San Juans so I flipped through the 14ers book and looked at a bunch of options. Since I really had never climbed on snow much before I was looking for something a little simpler. I would also be solo and didn't have a four wheel drive so I considered that as well. I decided on Mount Sneffels since I had heard the standard route is much better when snow covered. Usually in mid-June on a normal year much of the snow would be gone however the winter of 10/11 in Colorado was one of the wettest on record (contrary to the next one in 11/12). I also had never used my crampons before and was itching to start using them and put my new ice axe arrest skills I had learned to test. Since I needed to be in Silverton that evening this was also close by so I drove to Ouray and up the Yankee Boy Basin Road as far as my little car would go. It was dark and well into the night when I finally got my car parked along the side of the road and I managed too get a couple hours of sleep before twilight came. I unloaded the bike and packed up and began walking the bike up the steep road. Luckily for me though, just as I passed the famous "road cut" a nice lady was driving up and offered me a ride up the road. I was really happy and accepted. This allowed me to start the actual climb before sunrise and as I was walking up Yankee Boy Basin on the firm snow I saw the first rays of light hitting Gilpin Peak shown in the photo at left. I continued straight up the valley and was feeling fantastic. In well under an hour I made it to the base of the Lavender Couloir and caught up to a couple guys preparing to ascend. They were nice enough to show me how to put on my crampons and I was on my way practically running up the perfect snow. Man did I feel good. In no time I made it to the col and veered left working my way up the steeper snow by this point. 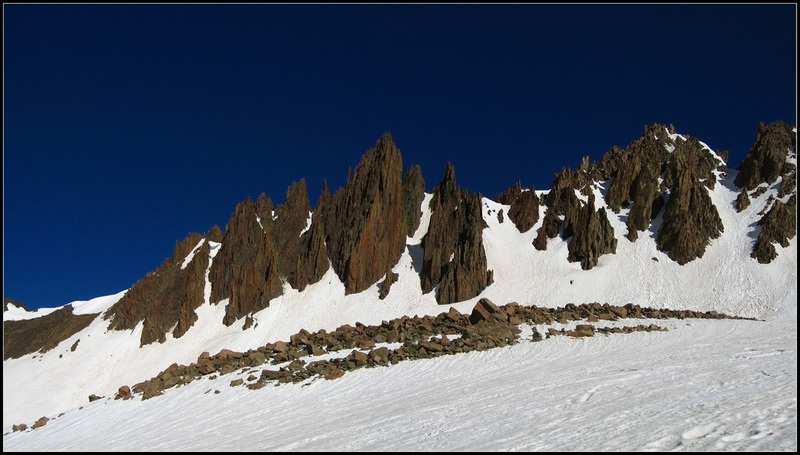 Now I didn't look too hard at the route description so when I reached the top of the couloir just below the summit I was greeted with a very steep drop on the northwest side I wasn't expecting. Looking for the correct way to ascend the final 100 feet, I first went right and quickly realized that wasn't right so I then went left around a notch and saw the final little bit to the summit.